I am a member of a warehouse club and when I do my weekly grocery shopping, I always start there. If I can buy it at the club, I will, even if it means I have to buy it in bulk. For things like paper towels or toothpaste, buying in bulk is only an issue with storage. I’ll use it and it won’t go bad, so as long as there is room in the cabinet, it goes in my cart. Lucky for me we have quite a bit of storage in the house, so that is never a real limitation. Buying food in bulk is another matter. Pasta, canned goods and items we use a lot are generally safe to buy, but it is rare that I will burn through 4 heads of romaine lettuce before they start to go bad. Some perishable items, like meat, can be frozen, so I’ll sometimes buy a large amount (five pounds of ground beef), segregate into usable portions (1.25 pounds) and then throw them in the freezer. 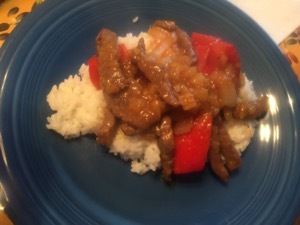 One weekend I was making my menu for the week and noticed a bag of frozen pork strips in the freezer that had been in there a while, so I added Sweet and Sour Pork to the menu. I purchased additional ingredients I needed and the night before, I moved the strips from the freezer to the refrigerator. I came home from work the next day and started getting out all the ingredients I needed for the dish. Only then I discovered my prom was beef. While I’ve never heard of Sweet and Sour Beef, I figured it was time to make it. This worked surprisingly well. 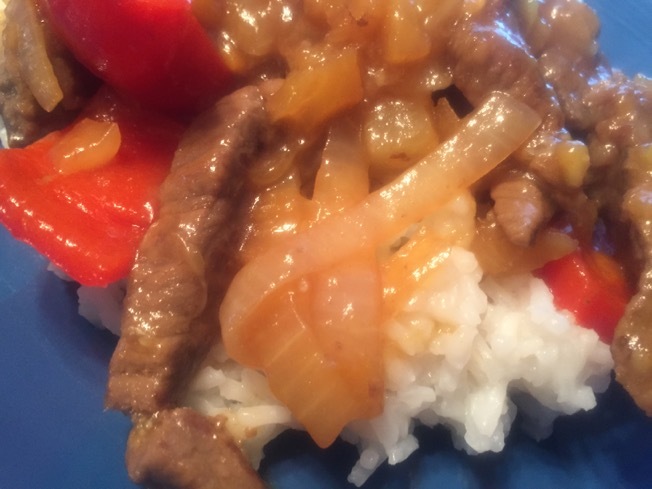 While the pork is a lighter meat and the flavors of the sweet and sour become more dominant, it still worked with the beef. 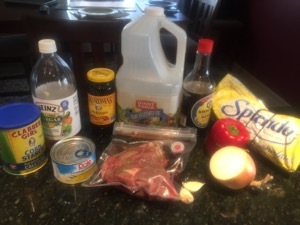 Here are my ingredients, with the bag of beef strips. Mix together the vinegar, Splenda, pineapple, soy sauce, molasses and garlic, and set it by the stove. Heat the oil in a wok or large skillet over highest heat. Add the pork and stir fry until it’s half done. 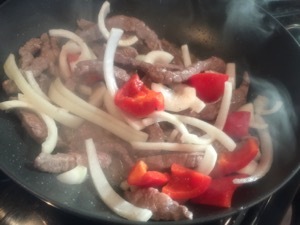 Add the peppers and onions, and keep stir frying. When all the pink is gone from the pork, add the vinegar mixture and stir. Let the whole thing simmer for a couple of minutes, stirring once or twice, until the vegetables are tender crisp. Thicken the pan juices just a touch with corn starch and serve.